I’m not usually one for writing about the death of famous people, however, this one hurts. Nearly everyone in their 20’s, 30’s and even 40’s will know who Linkin Park are. Last night at about 7:30 pm as I was looking at twitter I saw a tweet from TMZ. 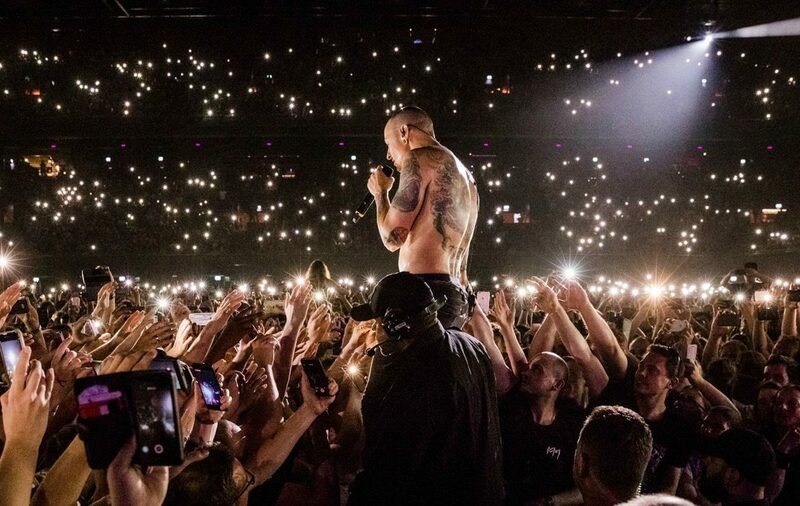 It announced that the lead singer – Chester Bennington had been found dead from an apparent suicide. I immediately looked at the other music related accounts I follow. Nothing. Thank god, it’s probably just another hoax. Then I saw more tweets, and it hit me – it was real. I was in shock. I sent messages to a few friends, including my friend Rhia, who took me to the iTunes festival once to see them. I will never forget that gig, seeing an arena band in a small venue like The Roundhouse was amazing. Whilst I haven’t been a fan of their later albums, the first two have always remained a favourite. I was 16 when Hybrid Theory came out and in my first year at college. By this point, I was already into rock/metal. Korn and Marilyn Manson were favourites, shortly followed by Papa Roach, Slipknot and Linkin Park. As a depressed teen music was my escape. It showed me that I wasn’t the only person feeling this way. I would wear ridiculously oversized jeans which could fit a cd Walkman in the pockets. The CD jumping with every step I took, but it didn’t matter. Music was (and still is) my lifeline. As I write this I have Hybrid Theory playing in the background, and although it is 17 years since it came out I still know every single word. And I’m sure I’m not the only one. In 2014 they played that album in full at Download Festival and I was absolutely gutted to miss it. Although I was lucky to see them headline Reading Festival in 2003, the year Meteora was released. We were down the front, and next to us was a little boy, probably 11/12. Looking back it’s crazy that he was on his own but he sang along to every single word. Linkin Park was the gateway to heavier music for a lot of people, and they also saved a lot of people. From looking at social media this morning the sheer number of people paying their respects to Chester is amazing. And not just from the rock/metal world. If anyone you know might be struggling – don’t ignore them. Ask them how they are. Even just saying hey might help them. If you need help yourself then you can call Samaritans on 116 123. It’s free and open 24 hours a day. Chester’s death hit me hard as well. I was a huge fan of Linkin Park. He will be greatly missed.